Oh, alright a much better outfit post. A cream lace dress from one of our visits to a H&M in Korea. It's really something Mum wanted and I just wanted to wear it once for fun. I like the higher neckline. Not so much the lace nor the cream colour though. 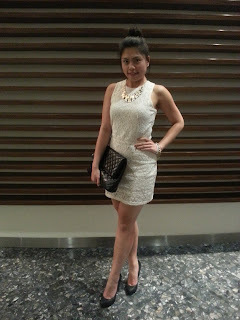 I paired it with my oversized leather clutch from Rubi and a black/gold/white chunky necklace I got from Bangkok. A little cutout for the back...just a minor detail which doesnt serve any other purpose except for aesthetics.